I’ve been watching the Democratic primary race for New York City Council’s District 20 with interest since I posted two weeks ago about some alarmingly sexist lines of attack used by incumbent City Councilman Peter Koo against challenger Alison Tan at a public debate. In that post, I lamented the distraction caused by the mudslinging between Koo and Tan that was focusing attention away from the important issues facing voters in Flushing and surrounding neighbourhoods. So, it was with dismay that I learned today that Koo had redoubled his sexist attacks on Tan in an interview with the TimesLedger, where Koo broadens his disdain to — apparently — all “angry moms” whom Koo says “can’t accomplish much”. This, as they say, just got personal. Koo just lobbed a broad insult against all politically-active women and mothers. Before we go any further, let me make one thing clear: I don’t really have a horse in the District 20 New York City Council race. Before Koo used unabashedly sexist language in his public debate against Tan last month, I wasn’t particularly focused on the race; and, I certainly have nothing personal against the councilman. He said Tan does not have anything but anger to run on and that will not get her far. There are so many ways to tackle this highly problematic and sexist quote. I could point out that Koo’s rhetoric relies upon the classic, misogynistic stereotype of women as over-emotional and illogical — a stereotype that, incidentally, is popular among contemporary Men’s Rights Activists. We could take issue with Koo’s (also wildly sexist) implication that Tan should be back at home, raising her children rather than in the political spotlight. We could remind readers that Koo has apparently made false accusations against Tan in an effort to support his sexist charges against her. And, all of that would be true. But tonight, I’m chafing at the very notion that Koo believes that “angry moms can’t accomplish much.” I’m furious that “anger” — a term so intricately linked to the political awakening of Millennial Asian America — is, for Koo, at odds with both womanhood and motherhood. “Angry moms” — particularly “angry” Asian American moms — have served as the backbone of the Asian American political community for as long as we can remember. Lily Chin was an “angry” Asian American mom who led the fight for justice after her son, Vincent, was brutally murdered in 1982. Yuri Kochiyama was an “angry” Asian American mom who fought for racial justice, feminism, and an end to state violence against political prisoners. Patsy Mink was an “angry” Asian American mom who revolutionized women’s rights in this country, and also became the first Asian American women to be elected to Congress or to run for the White House. Linda Sarsour is an “angry” Asian American mom who is currently one of the most prominent and recognizable leaders of the contemporary women’s movement and the fight to end Islamophobia in this country. It was thousands of “angry” women — many mothers — who were behind the largest labour rights demonstration in New York Chinatown history; the sitting representative of one of New York City’s largest Chinese American neighbourhoods should know that. Asian American history is replete with “angry” Asian American women, feminists, and mothers who have accomplished so much, not just with regard to racial justice but also in the fight for gender rights. Beyond the examples listed above, most of us would be nowhere without the driven and steadfast Asian American women and mothers in our lives. When Koo retorts that “an angry mom can’t accomplish much,” he dismisses the (physical, emotional, economic) labour of all women and mothers, and he lobs a senseless attack on all of us as well as against the fundamental existence of the (Asian American) feminist movement. 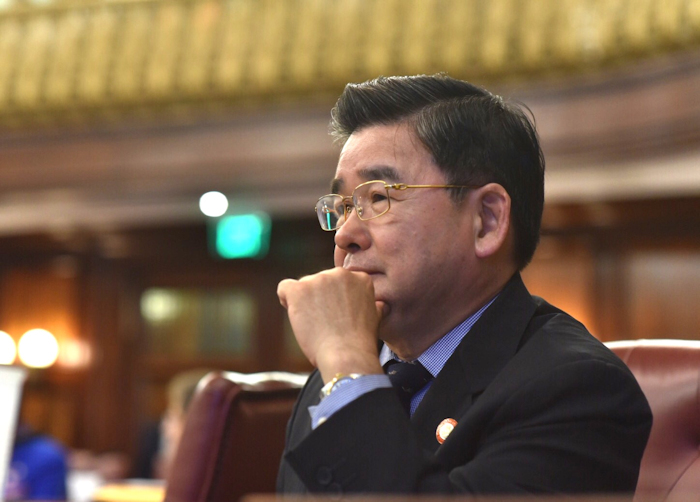 Councilman Peter Koo is a sitting elected official who represents thousands of New Yorkers and who styles himself the unofficial “mayor” of Flushing; moreover, he is one of the few Asian Americans currently elected to public office, and his constituency is overwhelmingly Asian American. Koo is a representative of Asian American New Yorkers, and — by extension — a representative of Asian America at-large. So, when Koo is overtly and blithely sexist, he does so as a public face of the Asian American community. When Koo blanketly dismisses “angry moms” as irrational and incompetent, he insults the millions of “angry” women and mothers — including the millions of “angry” Asian American women and mothers — who have accomplished so much over the course of American history. When Koo speaks so lowly of “angry moms” alongside other sexist rhetoric, it is women and mothers within the Asian American community that he denounces, and he does so as the current elected representative of downtown Flushing. Is this the kind of sexism that voters believe deserves to sit on the New York City Council? Is this the kind of sexist anti-feminism that Asian Americans want representing us and our interests? On Tuesday, September 12, registered Democrats in New York have an opportunity to choose between incumbent Peter Koo and challenger Alison Tan as their candidate for New York City Council in the general election this year. The winner of that contest next week will likely go on to win the general. Will Asian American New Yorkers really choose to re-elect this kind of blatant, unabashed sexism to public office? I certainly hope not.